I spent last weekend sharing a ski cabin with some friends from high school. I've known them for over twenty years, since before I was a photographer. The subject of high school yearbooks came up and I mentioned a photo from our yearbook that has grown in importance for me since I first saw it (click to see larger). When I first saw the photo in 1987 I barely noticed it. It was just another group portrait in the yearbook's club section. 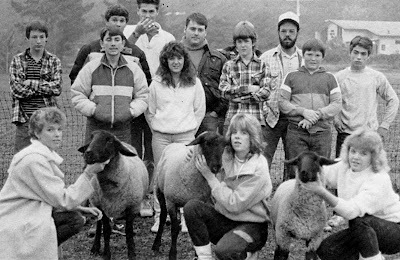 I didn't know anyone in the farm club, and nothing made the photo stand out at the time. This is easy to track now because photos of things I noticed are adorned with goofy salutations in loopy handwriting. But when I look at it 21 years later, the photo takes on new significance. It has transformed into a snapshot of the time and place I grew up. In one grainy moment it seems to capture the feeling of my hometown. Miranda, CA (I grew up 40 minutes west) lies in one of the most physically isolated regions in the contiguous U.S. My high school was 40 miles from any other, and it took an hour to drive to a stoplight. The background of the photo, the high school football field, was one of the few large flat spots in an extremely mountainous region. The funny thing is that the geography of the place seems to come through in the photo. Even if I didn't describe it, you might be able to surmise what I've just written from looking at the people in the photo. These are not city people. A photo that can describe an entire region while showing virtually none of it is special. But what really makes the photo work is its Disfarmeresque combination of carelessness and earnestness. You can imagine the photographer saying "Just stand over there a sec, ok kneel down in front, good...", then running off two or three shots as the girls try to get their sheep looking straight ahead. The blocking is off, weighted right. One of the boys is picking his nose, while another's face is completely obscured. Yet all of these "faults" actually help the photo work. They make it the quintessential small-town photo, so far from being art that it closely approaches it. When I mentioned the photo last weekend no one remembered it and in fact if I weren't a photographer I wouldn't remember it either. Guessing which photos from today will be remembered in 21 years is largely a crapshoot. This particular photo seems to support that idea that the more "artful" a photographer attempts to be --the more referential and self-conscious-- the more quickly it is forgotten, while photographers who record reality in less stylized documentary way eventually gain recognition. Some of the greatest photographers of all time --Watkins, Jackson, Atget, Disfarmer, etc-- didn't think of themselves as artists so much as documentary recorders. The recognition as art came later, as artlessness became arty. In contrast, most of the photos I see in galleries today are done by people trying to make not necessarily photographs but art. Some of them are good, some of them are bad, but the motivation for nearly all is to make art. I suspect that motivation will prove hollow in say 21 years or so.